← Old dog – new tricks? An Android logging app. Today was the annual Central Victoria Radiofest by ARV. The VK3 SOTA activators had arranged a table to promote SOTA to the general ham community, or at least those who go to hamfests. I am not a huge fan of wandering around looking at new radios I can’t afford or table loads of trash that someone once thought would by useful so I tend to avoid radio swapmeets. 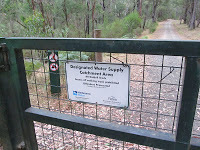 To support the SOTA promotion I had planned to activate VK3/VC-010 Riddell Ridge but on arrival at the gate I found signs telling me that off track access is prohibited in the water catchment area. As the summit I was heading for is off the track I decided not to proceed as it would not qualify as an activation if access was not lawful. There may be way to get a permit but, knowing the red tape government departments thrive on, I doubt it would be an easy process. So with Riddell Range off the list I decided to go to the nearest summit VK3/VC-033 Mt Toolebewong. I went into Healesville and made user of the complimentary WiFi offered at the Beechworth Bakery to post my intentions on the sotawatch web site and also to the VK SOTA yahoo group. I’ve been to Mt Toolebewong many times over the years but I have never operated from there. The top of the hill is not all that obvious as it is treed forest rather than a cleared peak. There is a narrow track to the top but it runs into private property. I followed the track to the private property sign and then reversed back about 400 metres. Knowing the lay of the hill I found somewhere to park on the corner of Nyora and Moora Roads. This intersection is within the activation zone so I grabbed my pack and headed down hill. I walked clear of the activation zone (25 metres below the summit) and then walked back up, past my car, turning left and into the bush, finding a small clearing where I could set up my antenna and tent. I was just a little past the small communications towers on the left. Here I threw a rope over a branch and hauled up my linked HF dipole and my 2 metre coaxial dipole above. For placing ropes in trees I use a small throw weight and some thin builders line. 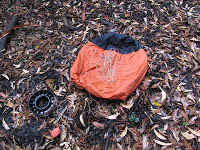 With all the leaf litter on the ground I laid the string out on my pack cover to ensure the it ran out smoothly. 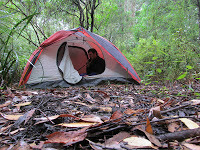 Under the antenna I set a small tent to protect me from the rain. I got on air about 9:30 am and kept working until about 1:30 pm. 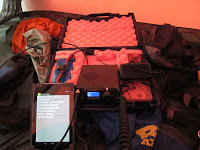 During this period I was able to work 20 QSOs, mostly on 40 metres, with many stations mentioning that they had heard about SOTA on the WIA news broadcast. The publicity of the start of SOTA in VK1 has certainly got people taking. There were quite a few activations going on but I was only able to work one of them, Ernie, VK3DET. I heard Peter, VK3PF on 20 metres but I had my antenna set for 40 metres and by the time I had changed it to 20 metres he was gone. I has the chance to try my new logging app and found a few shortcomings that I will revise in the coming days. Surprising what you don’t think of when you start out on these projects. With this activation my SOTA activator score is now 30 points for 12 summits, my chaser score is 580 and my S2S score is 8 points. I still have plenty of work to be do to catch up with some others.